Summer is almost over here in San Diego, and with the cold weather settling in, you might already be prepping your HVAC for the winter. Keeping your home warm is essential, but so is keeping your energy usage low. Having the right products installed will help save you time, energy, and money. 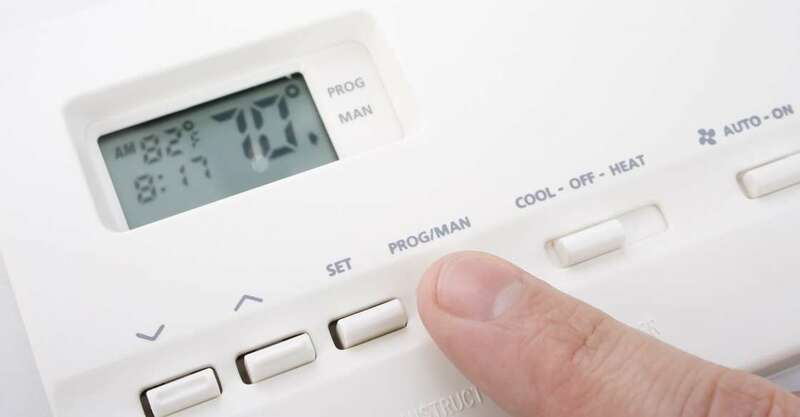 One of the more critical components of your air conditioning and heating system is your AC heater thermostat. The right thermostat settings help you rack up a considerable amount of thermostat savings per degree by heating up your home only when necessary. There are hundreds of different thermostat brands on the market. Finding the right one for your home can become overwhelming. Let’s take a look at the different types of thermostats, their optimal settings, and tips on the different ways you can keep your home heating budget energy efficient during the winter. A manual thermostat is a straightforward device that allows you to change the current temperature in your home. The temperature that you set it to is left as is, with no changes until you decide to increase or decrease it. With manual thermostats, you have to ensure you are keeping track of your usage as they will stay until you change the settings. These types of thermostats are prevalent and user-friendly. Programmable thermostats provide users with more money saving options. These thermostats allow for flexibility, scheduling, and monitoring. Depending on the type you get, homeowners can set different programs for each day or week. For example, you can set a temperature schedule for Monday to Friday and then have different thermostat settings for Saturday and Sunday. This system is beneficial for those who are looking to eliminate the guesswork or want to stop changing the setting every day. If you are looking to achieve maximum capabilities to your thermostat, you might consider smart thermostats. Smart devices are those that carry the power to connect to your home’s wifi unleashing a vast array of features. Smart thermostats give you the ability to control the temperature setting on your smartphone or another connected device. Many of these devices carry sensors that monitor your heating and cooling on their own, so you never have to worry about thermostat settings. According to Energy Star, a homeowner can save as much as 15% a year in heating and cooling costs by setting in back between 10 and 15 degrees. Lowering the setting can significantly cut your energy use and costs. When it comes to your home energy bill, your thermostat settings will play a significant role consumption. Other things to keep in mind are your furnace, your temperature preferences, and your lifestyle. If you are currently re-evaluating your HVAC, then consider calling an expert to help find the best system for your home. With the right system keeping your energy bill low this winter will be a breeze. Contact us to get started.